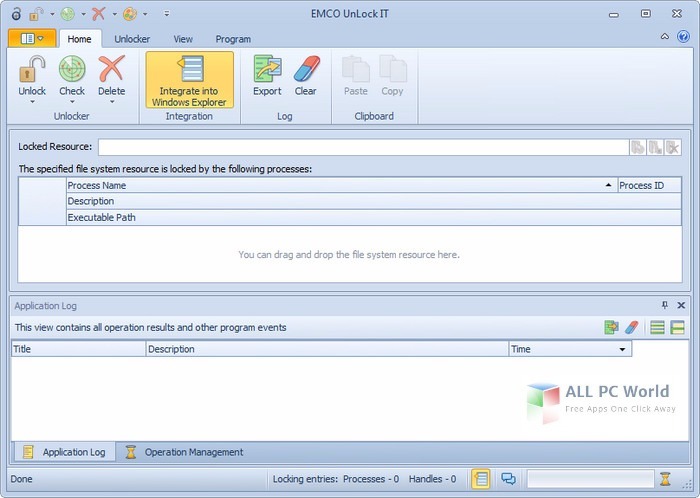 EMCO UnLock IT 4.0.1 is a powerful tool to unlock the system locked data efficiently. This free download is the standalone setup of EMCO UnLock IT for Windows 32-bit and 64-bit. As some running processes lock certain files and folders and you get ‘file in use’ error, sometimes viruses also lock their folders and data so that they can not be deleted. To unlock these files and folders, EMCO UnLock IT is the best solution for you. It provides a friendly user interface with clear-cut options for ease of use. It provides a ribbon with self-explaining buttons, you don’t need any technical information to operate this tool. If you don’t like the color scheme of the tool, there are various skins for the tool. You can view the complete information (name, description, process ID, and execution path) about the processes by just selecting the locked item. Moreover, it also shows the advanced properties of the process including DIS, processor time, priority, and working set etc. You can either close the file handles or kill the process to unlock the file. View the recent processes with their details and change different other settings. Click on the below link to download the standalone setup of EMCO UnLock IT 4.0.1 for Windows x86 and x64 architecture. It is a powerful process killing tool.